I started a new painting this morning. I have been painting for an upcoming show (at Galatea Gallery in July); my goal was 20 paintings, but actually this is number 18, the last I will have time for in this set. The composition was inspired by photos taken during my recent trip to Colorado. I was stuck by the patterns of streaks of snow on the mountains above the tree line, even in June. 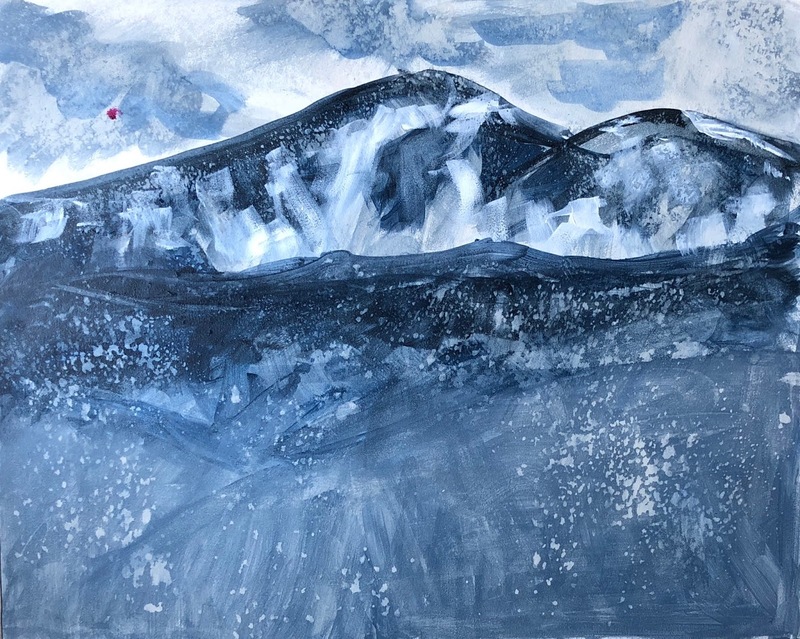 For this series of paintings, I have been working my way around the color wheel, but for this last one, I decided to mix up some gray. I am going to paint this one largely in grayscale, but with a pink sky. This morning I worked on this painting, and now I am ready to say that it is finished. 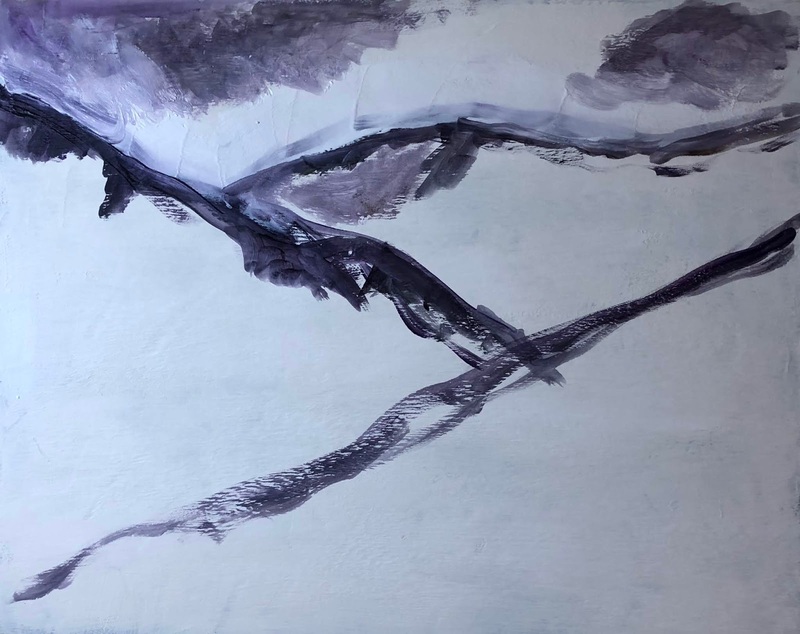 My mountain landscapes are based on my imagination and my memories of the mountains of Colorado. In this case the memory is recent: the sun breaking through clouds as we drove from Vail back to Denver. It was lovely and I took a quick photo. This morning I made a lot of changes by adding translucent washes to add color contrast. High time to move on; I have one more painting to go in this set. I worked on this painting today. 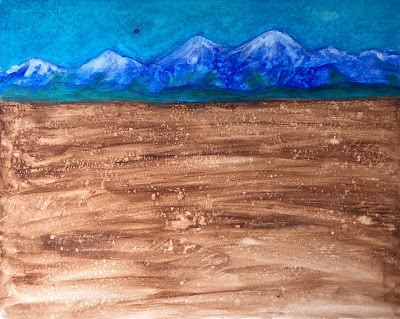 This mountain landscape is loosely based on a photo that I took during a recent trip to Colorado. We were driving back to Denver from Vail, and I saw a sunlit mountain beneath a break in the clouds. Today I used some green and yellow-green washes on the mountains, and some white and purple washes on the sky. I fixed a lot of small problems. Nearly there, but there are still a few little things I want to fix, so I will say, "To be continued. . . ."
This morning I worked on this painting. I have been painting "Mountain Daydreams," acrylic landscapes based on my imagination and memories of the Colorado mountains. 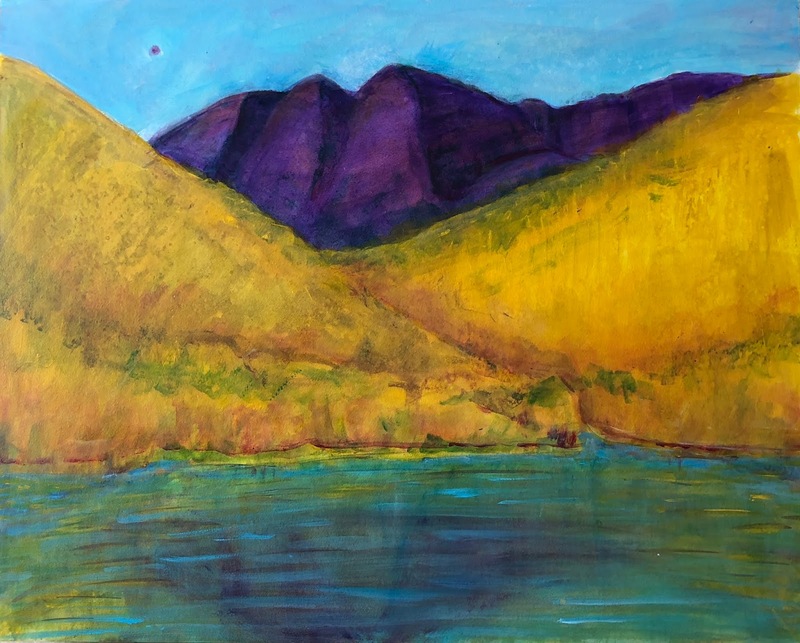 In this case, my painting is loosely based on a photo that I took on a recent trip to Colorado. We were driving from Vail back to Denver when the sun came out from behind the clouds. 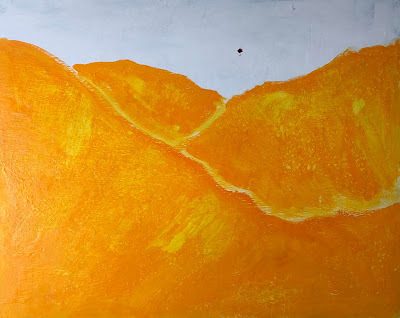 This morning I modified the shape of the patch of sunlight, and lightened the most distant mountain. Then I worked on the sky, modifying the composition I had roughed in. This is getting better, but there is more to do. This is the painting I started yesterday, just roughed in the compsition. This morning I began with the color. 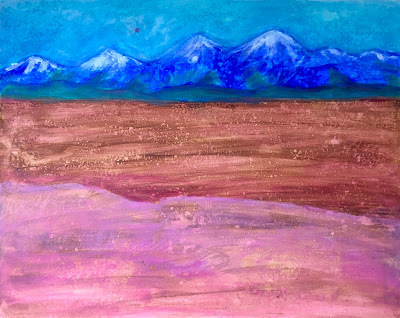 This "Mountain Daydream" is inspired by a photo I took during a recent trip to Colorado. We were driving back to Denver from Vail, and I saw a bright sunlit area on the dark mountains where the sun had broken through some gray clouds. To be continued. I got this painting started this afternoon. I have been waiting hours for the primer to dry, but finally decided to at least sketch out the composition. Despite the title, neither sunlight nor green mountains are visible at this point, but they will appear eventually. This painting is loosely based on a photo that I took during my recent trip to Colorado. 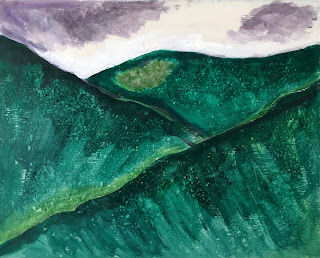 On the road back to Denver from Vail, the sun broke through storm clouds and created a sunlit patch of light green on dark green mountains. To be continued. . . . This is a painting that I started several weeks ago, but I have been reworking the foreground and finally finished it yesterday. This is another of my "Mountain Daydreams," painted from imagination and memories of the Colorado mountains. 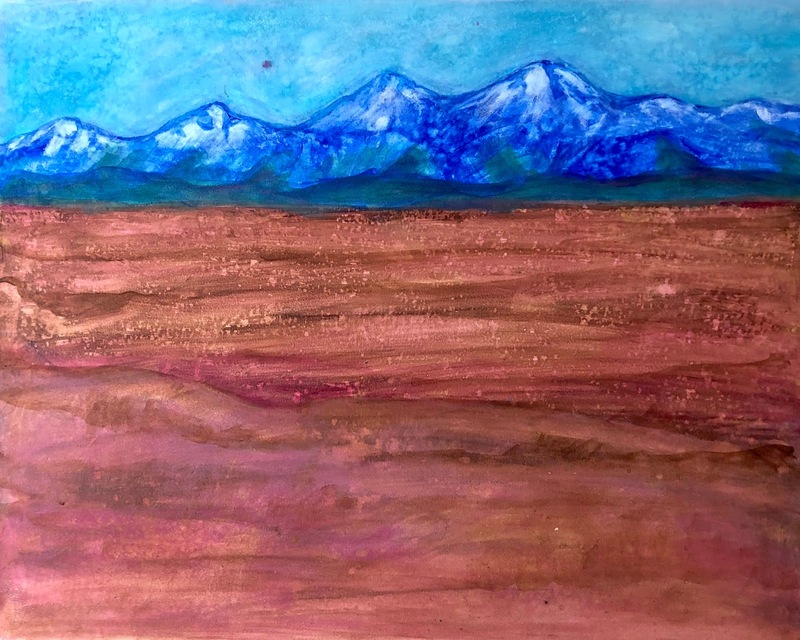 Of all of them, this one comes closest to home, the mountains I remember seeing on the horizon near Pueblo, Colorado. This is my most recent painting. 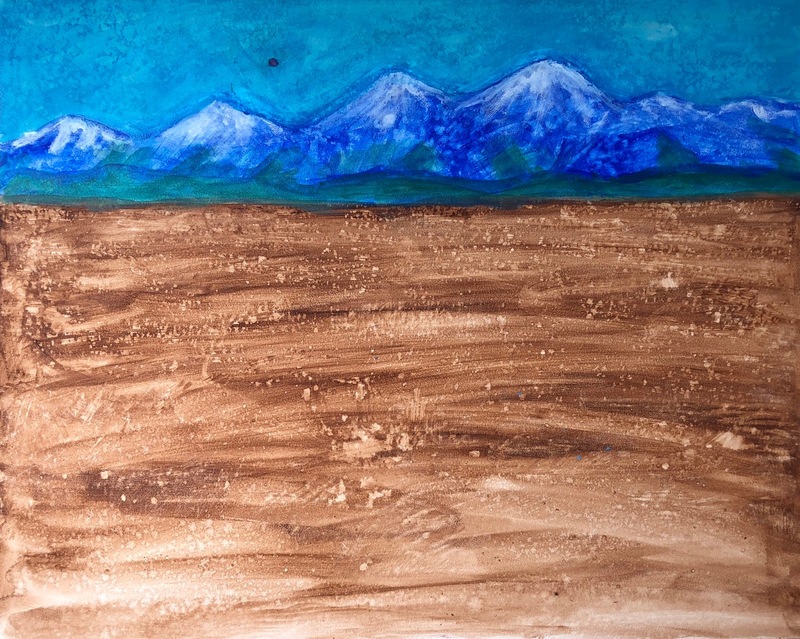 This is another "Mountain Daydream," landscapes from my imagination and my memories of the mountains in Colorado. This morning I cleaned up a few problems, and added a bit more contrasting red-violet. Now I am willing to say this is finished, apart from small changes if I see any little problems. This is acrylic used with water, 16 x 20 inches. 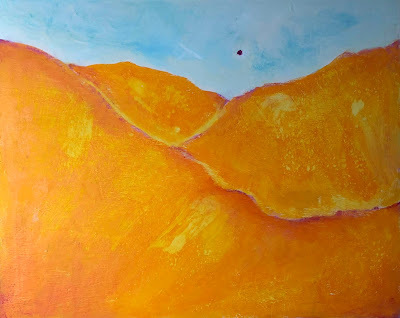 This morning I worked on this, the painting that I started yesterday. 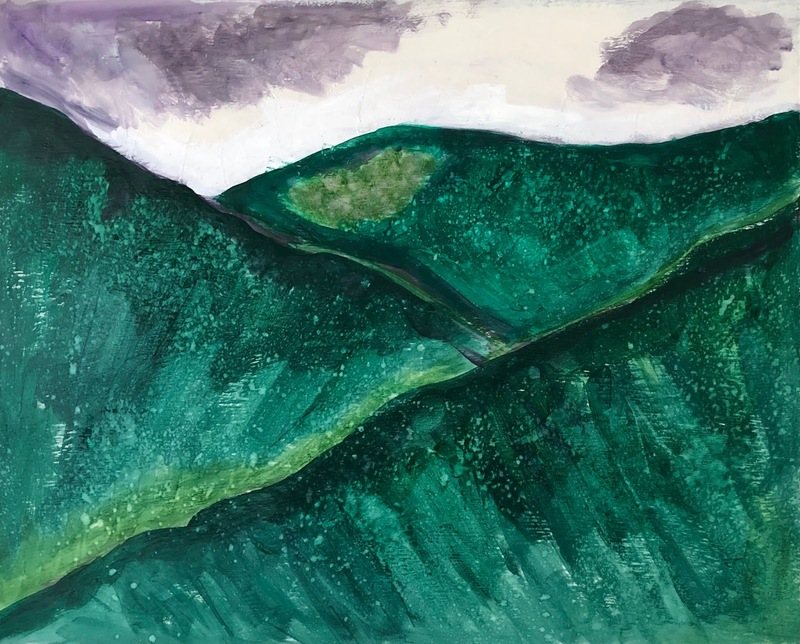 This is another "Mountain Daydream," painted from my imagination and my memories of the mountains of Colorado. Today I added a pale blue to the sky and a few touches of violet to suggest shadow. I want to keep this one pretty simple, so there's not too much more to do. But there are a few small things I want to change, so I will say "To be continued. . .". I started this painting today. This is another of my "Mountain Daydreams," paintings from my imagination and my memories of the mountains of Colorado. I am working with acrylic with water on treated wooden board, 16 x 20 inches. I have been away from this painting for a while (on a trip to Colorado), but have also been thinking about this painting in the meantime. This "Mountain Daydream" is based on old memories of seeing the mountains in the distance from the high plains near Pueblo, where I grew up. I decided to rework the foreground a bit, and got started with that yesterday. I have been traveling and away from this painting for a while, but I have been thinking about it. Today I added some washes to simplify the colors and emphasize the shapes in the painting. This is acrylic used with water on Aquabord, 16 x 20 inches. Here is the painting I have been working on. 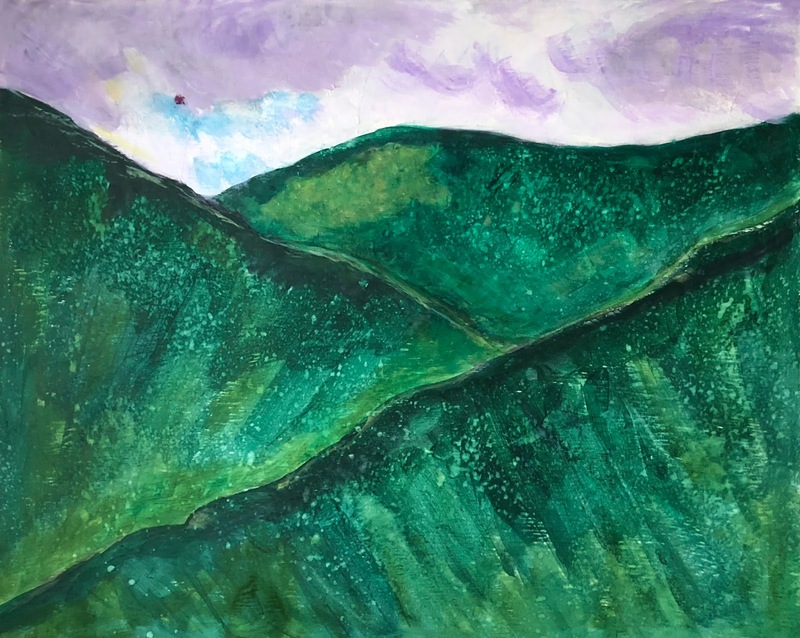 This "Mountain Daydream" is an attempt to capture memories of the mountains on the horizon. When I was growing up in Pueblo, Colorado, a trip to the mountains was about 30 minutes away in any direction, and only an occasional excursion. But those mountains were always visible on the horizon. 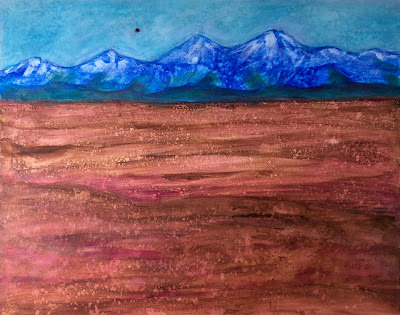 Today I lightened the sky a bit, added some red-violet wash to the brown foreground and to the foothills. 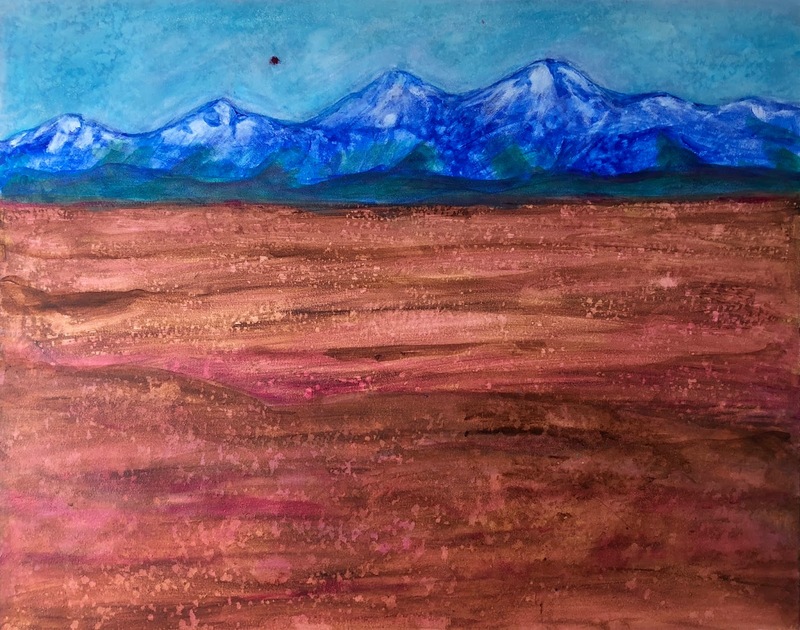 I also divided the foreground, trying to suggestion a view of the mountains from a higher vantage point. To be continued. . . . I started this painting two days ago. 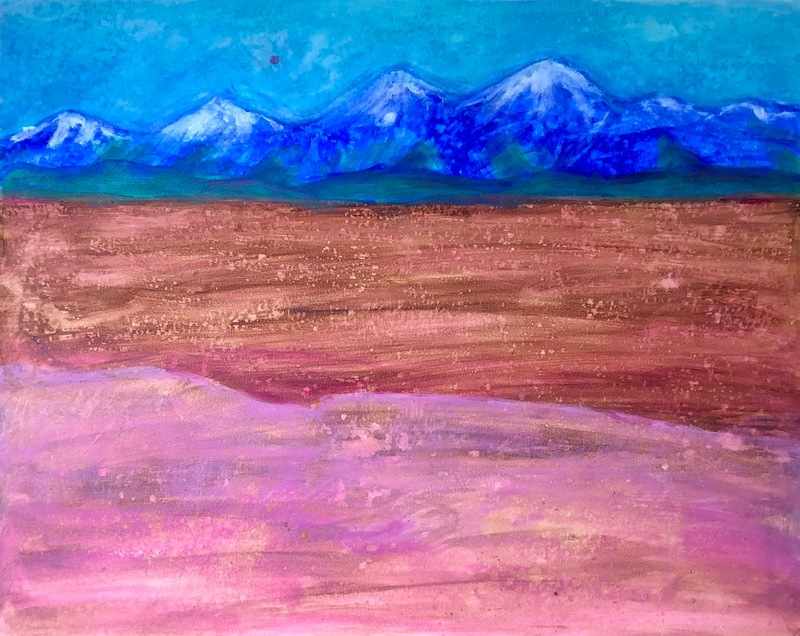 This is another "Mountain Daydream," landscapes from my imagination and memories of the Colorado mountains. In this case, the memory is the mountains that were always on the horizon. I grew up in Pueblo, Colorado, about 30 minutes from the mountains. But I saw them every day, and in my mind's eye, I still do. Today I worked on the composition and the proportions. 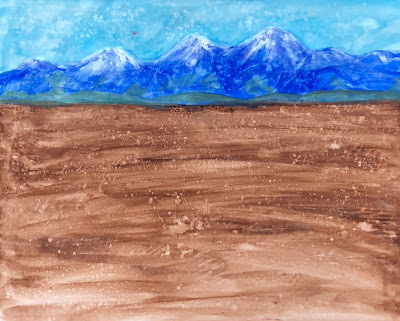 I revised the top line of the mountains and brought the line of the sky down by about 3/8 of an inch, but it made a difference. To make that change, I added some turquoise to the sky. I like it, but plan to make it lighter. 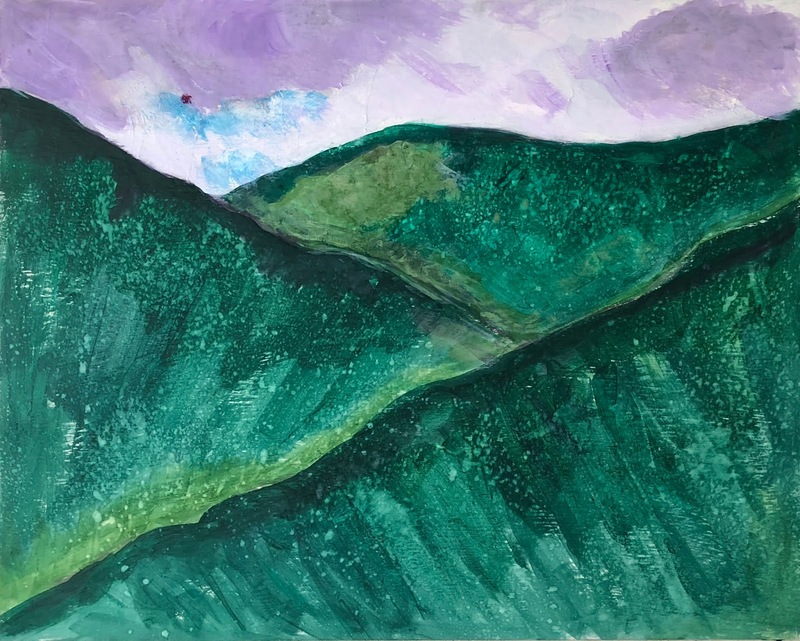 I also raised the line of the foothills and used some green to define the area. I don't think that's the final color. I am also planning to modify the foreground color. To be continued. . . .. . This is the painting I started yesterday, another "Mountain Daydream," this one based on memories of the mountains I always saw on the horizon when I was growing up in Pueblo, Colorado. 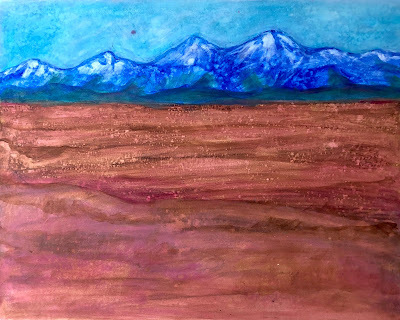 Today I added some color to the sky, some white to the mountain peaks, and a suggestion of foothills. To be continued. . . .